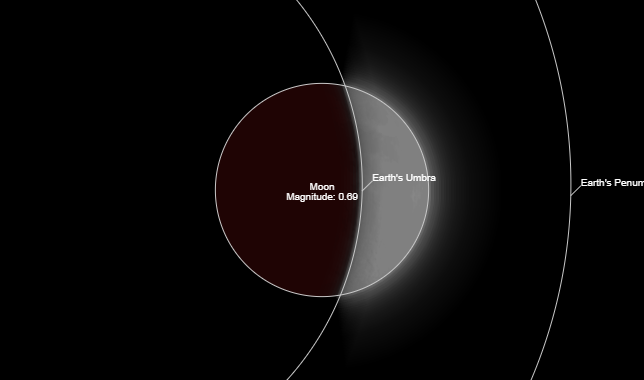 In the lead-in to 2018’s first eclipse on January 31st, we’d like to share a meditation connecting this alignment of total eclipse of a Super Blue Moon (called a supermoon while at the closest point to Earth in its orbit, a blue moon as it’s the second full moon in a calendar month, and also a ‘Blood Moon’ as the total eclipse will give it a reddish hue). In this local cosmic dance, eclipses always align in pairs, and January’s lunar eclipse will be followed by a partial solar eclipse on February 15th, a day before the celebration of Chinese New Year. At a higher level, the vibrational ‘stream’ of lunar to solar, white to gold, during this passage, will open another level of this year’s ’11’ Gateway energy…and as the Earth is poised between the ‘light pillars’ of Sun and Moon in these eclipse moments, the triune (three-in-one)/trinity vibration activates highly. Feel this as a potent moment of activation for the 3-strand DNA we spoke about in a previous post (which creates the ‘landing template’ for realization of 12 subtle light strand activation in 3×4 bundles). Total eclipses vibrate high potential for release of the old grid of limiting beliefs, structures and stored memories that weigh down personal and collective energy fields around the planet, and with an energetic theme through this year of deep release and transmutation of the war and associated trauma vibrations layered into the collective consciousness for millenia, this eclipse of a Super Blue ‘Blood Moon’ is a highly charged activator for aligning the flow of rebirth with Gaia, through the Earth Grid and planetary flow lines. Many loving light beings around and within the Earth are assisting and amplifying this alignment, and leading into the eclipse I’ve been seeing lightships of gold, peach, red and white light, with many orbs appearing in photos in the light peachy-gold to cherry red spectrum…as the focus converges into transmuting misused ‘red life force’ energy converted to anger and violence through the peachy-golden radiance of the Sacred Heart vibration and the deep pure life energy of the Ruby Ray. Feel the transformative vibrations emanating through these orbs, from soul groups who radiate transmutation of misaligned red energy into divine peace and ascension. 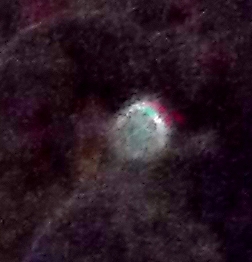 Red-gold orbs, with green and blue friends, spiral around the Diamond Cross, Jan. 23, 2018. And again, with a moon orb aglow with a rim of ‘new light’, rebirthed. The texture of the lunar orb in this photo reminds me of the Moon’s crater-marked 3D surface, scars of bombardments exposed and ‘lit up’, deeply symbolic of the eclipse effect on an energetic level as old hidden or avoided hurts are ‘highlighted’ in the small self, with the opportunity to bless them with compassion, release them in peace, and rebirth in joy. Earth and Moon orbs, January 28, 2018. Around the Earth, Phoenix rebirthing energies are already amplifying and spiralling, diamond white and peachy-gold, and we invite you to join in anchoring this alignment in pure Divine Love, Peace and Unity (if you’d like to time your focus with the peak of the eclipse, it’s at 13:29:51 UTC ~ or if you prefer, just hold the intention to converge with the moment of Sun-Earth-Moon alignment). *This is shared as a visualization, but if visualizing doesn’t resonate for you, please feel free to read through and hold the intention below from and through your heart of Divine Love. Breathe into your heart centre, let a star of pure white light form there and radiate all around you. Feel the Love that you are, infinite and eternal, in unity with all the Lights of Love holding the focus of divine rebirth and ascension with Earth. In unity with all Lights of Love guiding and supporting this planet, and with all the high light grids and templates of renewal. Connect from your heart star with a beam of Love and Gratitude to the heart of Gaia and the heart of Source in the beautiful Oneness, and let your aura, your torus field, fill with golden light. Feel your whole being continuously bathed in this golden lovelight of Source, transforming any dense energies in your aura, any dense energies that come toward you, into the highest Love and Light. Visualize a soft White Diamond Light ray flowing through you from Source to the heart of Gaia (crystalline light core of the planet), then spiralling outward from the centre of the planet, expanding until this Light is moving around the whole Earth. Now visualize a Golden Light Ray flowing through you from Source, to the heart of Gaia, then spiralling outward in the other direction, crossing over the White Ray, creating a white and golden helix gently streaming around the Earth. See a White Phoenix and a Golden Phoenix bird form within the two interweaving streams and guide them out further, the White Phoenix guiding the White Light out to and around the eclipsed Moon, the Golden Phoenix guiding the Golden Light out to and around the Sun, opening the Eclipse Gateway of maximum rebirth potential for all. Then see them returning along their spiral light streams to meet in the centre of the Earth and merge as One with Gaia’s heart. See a radiating light flow now in all directions from the centre of the Earth, peachy-golden and diamond-white. As this merged light moves through the planet, it dissolves layers of old war and trauma energies, releasing them in the freedom of sacred cherishing Love, transforming them into Peace. Feel a wave of love and joy igniting in this moment of release and rebirth, and know that its ripple will continue to vibrate and anchor deep within the collective energy field from here on. And So Be It. *For more insight into the Diamond Cross Ascension Light, read this post. During the last week, and especially in the window since the Full Moon, another very high vibration in an unfolding sequence of uplifting Light has been focused toward the Earth, and will anchor into the planetary energy field and supporting light grids fully on the 10-10-2017 (2017=10). This vibration streams through the colour ‘tones’ of purple and golden light ~ resurrection and restoration of the inherent ‘sacred goldenprint’ of life from a limited state of expression to natural expansion and expansiveness, through compassion and surrender to Source. This is a profoundly gentle energy of Giving, aligned when we’re in a state of unconditional compassion for ourselves and others, loving the Oneness of All as the personal self gives itself completely to the loving overview and guidance of Source through the merging of what we call our ‘higher selves’ (focused guiding aspect of our Oversoul) ~ yet it is also deep and intense, a pure Gift received and shared freely, available when we allow ourselves to bathe in compassion and devotion, and become a reservoir for the golden Christ light of renewal. In The North Star, we mentioned the Silveray as the first of nine beautiful motherships to be regenerated from the imprints of original templates held in higher dimensional crystals that were formerly Core Crystals of these lightships, now retrieved, purified and healed. Since then, three more of these ships have ‘rebirthed’ ~ the Butterfly (Ba’Shiila), the Sapphire Star (Elam’Ashar) and the Caritas. We’ll return to the first two in a new post, and will focus with the Caritas today, as its energy is related to a particular purple and golden light which it is transmitting from another galaxy. Following on with the theme of ‘north’ and being in one’s ‘true north’ from a soul purpose perspective, the Caritas hails from Alphecca, alpha star of Corona Borealis, the Northern Crown, a small constellation that contains a magnificent galactic supercluster. This magenta-purple is a perfect representation of their Light ~ purple, through which golden light shimmers like fluidic light ripples. The ‘A-Bells’ are a collective angelic light consciousness who vibrate the spirit of giving from pure Love ~ without any expectation or focus on what is returned, but simply for the expansion of Love. And this purple-golden flow of unconditional free giving is being focused to the Solar System and Earth now through the Caritas, amplified through the lunar portal leading into and on the Full Moon of October 5-6, and intensifying through the 10-10-10 Gateway. Bring your focus into your heart centrepoint, breathe deeply…and let your body and mind relax, letting all tension and distractions go. Relax into the Love that you are, let its natural warmth strengthen in your heart and radiate through and around you as a radiant star of pure light. Connect from your heart with the Heart of Source and the Heart of Gaia, with love and gratitude. Focus your intention on connecting with the universal flow of Giving, and that as you open to this gift of Giving through the Purple Light of Compassion, it flows and ripples through you to all life on Earth and beyond in an infinite stream. You are the infinite stream, as it flows eternally through you. Feel the light-heartedness of this Purple Angelic Light, like a kiss in your heart that effortlessly radiates through you, bathing your whole being, extending to all life, free in and with Love. Now see/feel a stream of Golden Light flowing down through you, shimmering through the purple, dancing through you, pure and warm. As the Golden Light flows down through you, all your chakras ignite and activate as balls of golden light, you can feel this light directing through your Heart Chakra and Resurrection Chakra, all unified, balanced and freely flowing in One Flow. As your chakra column lights with gold, it spreads as simply as breathing out, through your whole being down to the DNA strands, molecules, cells in your body, ions and subtle layers, your whole energy field, in this beautiful stream of Giving, as you give yourself to Source, where you always Are. Let yourself bathe in the renewal and regenerative vibration of the purple and golden light, and feel this vibration enveloping the whole planet on every level, infusing the collective energy field with resurrection-through-compassion. And So Be It. Love, Joy and Peace to you all for the Divine 10-10-10, we’ll meet you there! 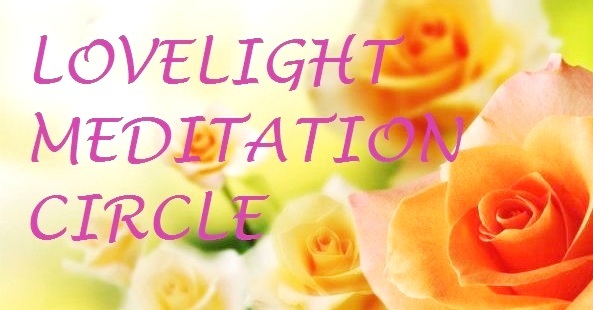 PS: You can find a related meditation here, which began on Sunday with the LoveLight Meditation Circle to assist planetary ascension. PPS: If you’re new to Heart Star, you can read more about the Resurrection Chakra here. Dear friends, in this little ‘breathing space’ between Christmas and the New Year, I have reconnected into a specific energy known to me in other lifetimes – immaculate conception – and its relationship to the term ‘INception’, the bringing in and igniting of higher dimensional frequencies in a third dimensional form. I’m asked to share this awareness now, on the brink of 2014, just before the timing of the New Moon on New Year’s Day. 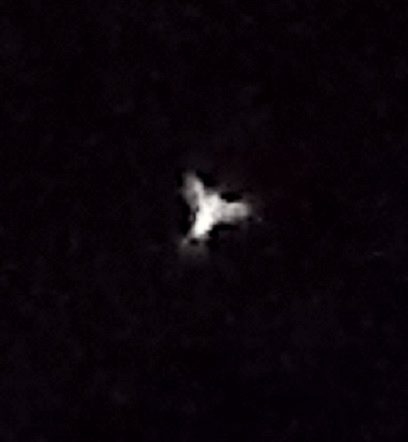 In the photos below, taken on Christmas Night, you can see how this energy is mirrored beautifully by star family, elementals and other transdimensional beings. 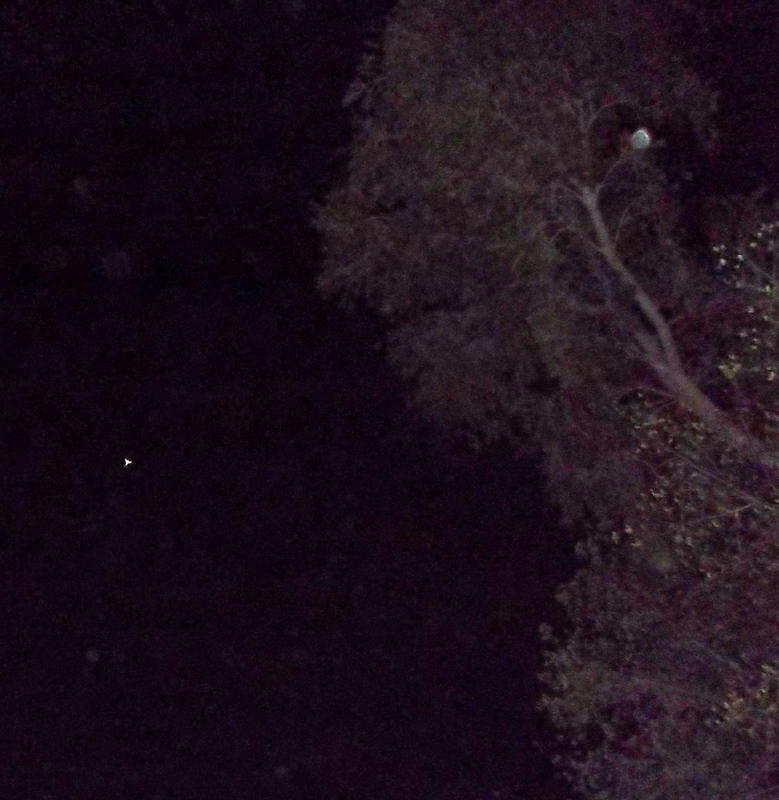 The first ‘signal’ was the appearance of three Orbs who I refer to as the ‘Three Wise Men’ right beside the tallest tree in my back garden. 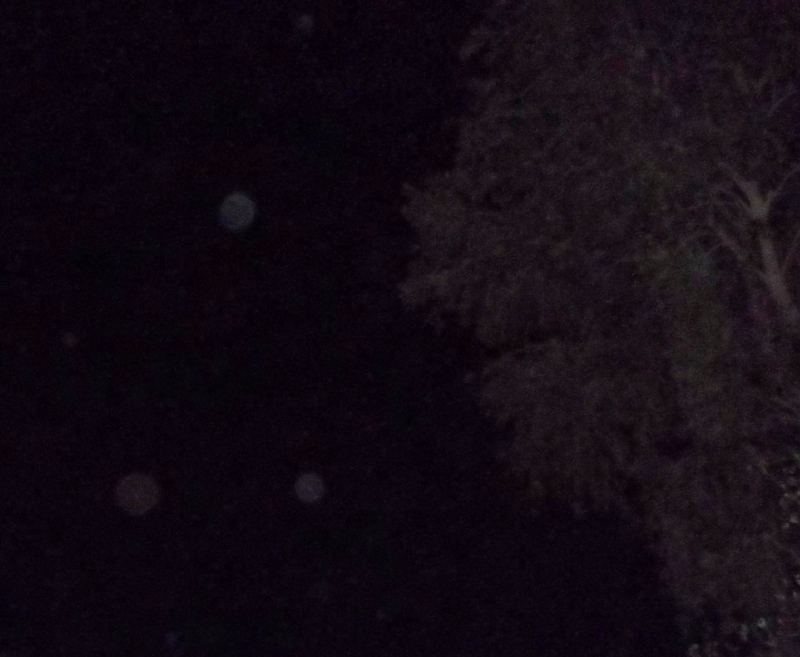 As you may know from previous posts, these Orbs have been here throughout December (they are the projected Essences of certain star family members), while I followed the progress of the comet ISON, which came with a strong ‘catalyzing arc’ to deeper ignite the light of 5D+ frequencies in Earth’s humans at this time. INception is the process of transition from a third dimensional carbon-based physical body to a fifth dimensional crystalline light-based physical body: the process of allowing IN the stream of unlimited Love to every unlocked, cleared, opened cell, strand of DNA and ion in our beings, to the degree that our overall vibration lifts into a faster strata and anchors there. Gaia is already established in 5D, and humanity is currently in varying degrees of confluence (or dissonance) with her ‘rebirth’. To complete this process requires a continual ‘choosing’ to BE in, and hold, Heart-centredness (to hold the faith in ourselves, our Higher Self’s Knowing, and the guidance of Source) no matter what…rather than reacting to the barrage of Heart-disconnected acts in the ‘duality screen’ of 3D, whether of a physical, mental or emotional nature, and to our own/others’ ego plays. When we hold Heart-centre, aligned with our Soul Star and Earth Star centres*, we invite in the ‘holy spirit and ignite a rebirthing of ourselves in harmonious higher frequencies. INception (from incipere, ‘to begin’ in Latin) is our starting point, our springboard, into unimaginable heights of Love and Bliss that manifest as we imagine them, when we are in full alignment with Source. In the second photo, an Orb flashed brightly in the tree beside the Three Wise Men, before floating up the trunk toward the higher branches. 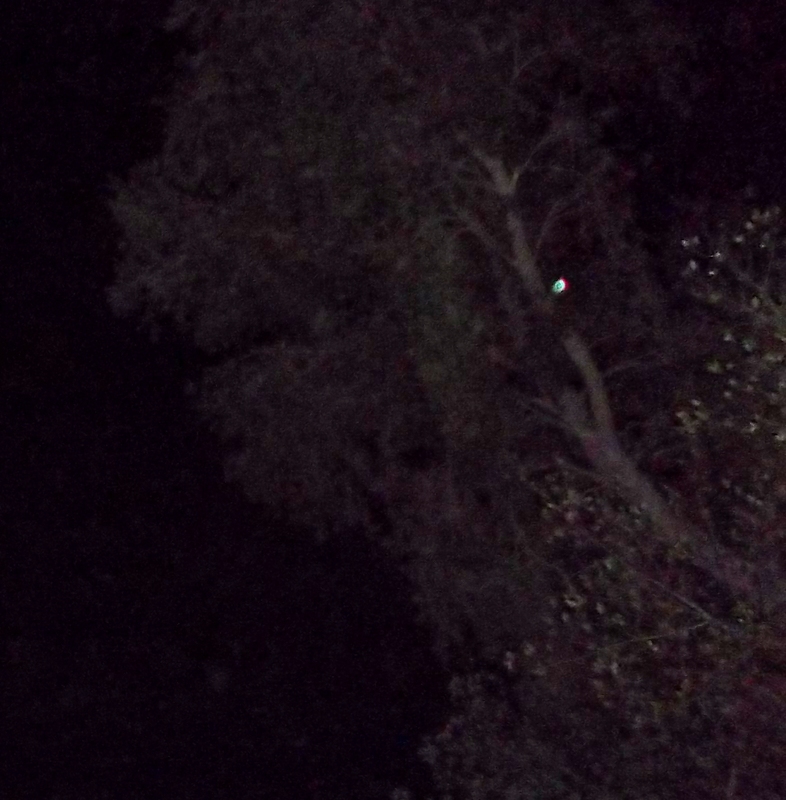 A few seconds later, a Dove of white light appeared to the left of the tree, and the Orb sat like an egg in a nest in the upper branches. Religious doctrine put a particular slant on the concept of Immaculate Conception, linking it to a single event/person. In my higher knowing, this energy, this flow, simply means an ignition of Life through a frequency that is IN perfect harmony, pure confluence, with Source’s creational power – and is infinitely available in service to Source. It is an inviolable conceptive/INceptive frequency that cannot be used to serve small self wants, since it can only take place within full alignment to Source Love. Note the dictionary words closest to immaculate are ‘immanent’ and ‘immaterial’. Do you feel the vibration of free-flowing, flawless creative energy here? So we stand on the cusp of a new year, with the energy of a new moon (which is the time of the setting of a new seed in the lunar cycle), like an egg in a nest, overlighted by the holy spirit of our Higher Self as it descends into our opened ‘form layer’…or wraps around it. Really, it is both and the same, and the aspects of us currently in the experience of limitation are opening deeper to its embrace. Immaculately present to our Hearts, making the immaterial immanent – fully present in the Now – through our INceptions, personal and collective. This truly is Christing energy/Light of renewal in action. It is us. the world I was thinking about was immaculate conception, especially parthenogenesis. He asked me if I would I like to hear the story about his mother. I said, “Yeah, sure”—you know, while I was figuring out the geometry, not really too interested in his story. Then he told me a very unusual story. I didn’t know what to think about it. He simply told me the story and left. After he left I wondered, What was that about? process of having this baby…they understood immortality and became immortal. This happened a long, long time ago, near the beginning of our race. Eve lineage or from the part of the human lineage that was supposedly sterile. ones to use this way to give birth. how they would die and ascend to the level of Venusian consciousness. Adam and Eve period in history up to the time of Atlantis. connecting the two sides of the island of Udal in Atlantis… At one point Thome left Atlantis—he simply disappeared off the Earth and went to Venus, leaving Sekutet and Thoth here on Earth. what that was all about…Later on he came back and said, “You really need to know more about virgin birth,” and he told me to study it. subject. The more I read, the more amazing it became. union you re-create the living holy trinity on Earth. And so it IS. Whether we express this energy in the creation of a child in Divine Love (outward manifestation) or through the INceptive process of igniting our inner Divine Child in the merge of our sacred feminine and masculine within (inward manifestation), embracing the Dove of Love and igniting the cell/egg is available to all of us. On Christmas Eve, this practice came through, as an aid to merging sacred masculine/feminine and receiving/grounding the child energy. Relax, slow your breathing, and focus into your Heart centre. Crown breathe (think whale or dolphin) white light into your heart and through the chakras in your body, opening the prana tube. 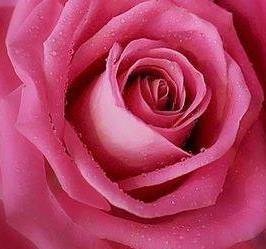 Visualize a deep pink Rose in your Heart centre. Now see blue all around it, spreading out in every direction, as if the Rose is floating on a calm sea. See/feel a beam of gold light coming down from Source through all your upper subtle chakras (if you know them), through the Soul Star, Crown and throat and into the Rose in your Heart. Feel the golden light pool within the centre of the Rose, peaceful and revitalizing. Then send the gold light down through your lower chakras and Earth Star chakra, to the Core of Gaia. Feel this gold streaming gently through your Being, settling and anchoring, embraced in the perfect balance of Mother and Father as One. In Love, wishing you All a glorious 2014! Namaste. * The Soul Star chakra is one hand’s length above your head, and the Earth Star chakra is below your feet, connecting to Divine Father and Mother respectively. Together with the Heart Chakra (or three heart chakras), they form three overlapping ‘centres’, the Heart Centre, Star Centre (with the centrepoint in the third eye/pineal gland) and Earth Centre (with the centrepoint in the sacral chakra).